Anthony Fletcher uses the papers of his artistic great-aunt, who, as a young nationalist, wrote an eyewitness account of the Easter Rising, to explore her youthful patriotism and vigorous activism. The life of Cesca Chenevix Trench (1881-1918), who took the Irish name Sadhbh Trinseach, is revealed by a remarkable archive in the family’s hands in County Wicklow. Containing a mass of letters, sketches and personal papers, as well as her diary of the years 1913 to 1916, this archive illuminates and explains how a girl from a leading Anglo-Irish Protestant family, brought up in a vicarage in Kent, adopted the identity of an Irish Irelander and became a staunch nationalist. Returning to Dublin from her training to be an artist in the Paris studios in 1914, Cesca was swept into an active role in Irish politics in the first months of the Great War. 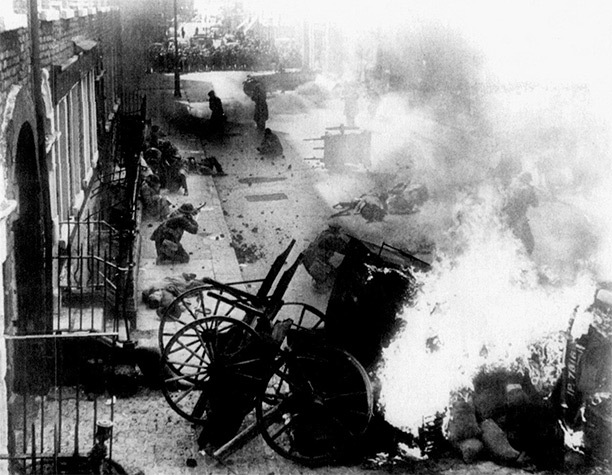 When the Easter Rising broke out on April 24th, 1916, she felt bound to act, though, living with a Unionist and deeply British mother, she felt constrained in how to do so. Her diary records the hopes and fears of a nationalist who believed in Ireland’s freedom but saw a Rising just then as a tragic tactical blunder. After the Rising she was thrilled by the progress of the rejuvenated Sinn Fein party. She saw how cathartic action had created a new Irish politics. More than once between 1913 and 1918, Cesca recorded her sense of living in a historic time. Already intoxicated with the land where her mother had grown up, in the 1860s, in a grand villa on a County Offaly estate, Cesca began, as a teenager, to challenge the constraints of class and gender which seemed to place her future in shackles. At boarding school in Malvern between 1906 and 1908, she pillow-fought the English girls in the cause of Home Rule and contested it with her history teacher. Not for her the round of tennis and house parties to establish her English marriage credentials. Living in Folkestone from 1908 to 1913, she spent as much of each summer as possible in Ireland. Her cousin Dermot Chenevix Trench was a crucial influence on the development of Cesca’s nationalism. A rebel from within the family like herself, after Eton and Balliol, he helped the radical poet and painter George Russell (A.E.) edit The Irish Homestead and campaigned for the Gaelic League, in a pamphlet which argued cogently that extension of spoken Irish would bring a renewed pride in Irish industry. Cesca was devastated when Dermot shot himself in 1909. ‘He might have done so much with such ability,’ she wrote to her brother Herbert. It was under his tutelage that Cesca opened an account at Gleasons in Dublin, which sold Irish goods only. She and her sister Margot, as nationalist as she was, pledged themselves to abstain from whisky, beer and tobacco unless manufactured in Ireland. They collected signatures in 1912, during the revived Home Rule agitation, for a petition for all Irish taxes to be lodged in an Irish treasury. Cesca’s uncle, Henry Butcher, the Unionist MP for Cambridge and a leading classical scholar, owned a house at Killarney where he introduced her to the Kerry landscape. She was flattered by his letters, full of Westminster news and gossip, but they fell out, in October 1910, over his opposition to Irish as a compulsory subject for matriculation at the new National University. She was furious when, with other guests at his dinner table, Butcher ran down spoken Irish, deriding nationalists like herself for imposing it on a reluctant populace. Cesca found it hard to tolerate the attitudes of Anglo-Irish relatives with whom she stayed: ‘the cousins make such idiotic jokes and talk about such idiotic things and look at life in such an idiotic way,’ she wrote to her sister, ‘with their dogs and their horses and their swans and their crops and the weather and their neighbours, it’s too awful’. ‘How beastly Uncle Benny is,’ she told Margot. She was incensed at his sneering at Margot, telling her ‘I should be dressed in green because I am a Home Ruler.’ Both girls gave their mother a hard time but Cesca, with her quick mind, a cousin who stayed at their home noted, was ‘the worst sinner’ in this respect. The most ecstatic experiences of these years were the Gaelic summer schools Cesca attended on Achill Island in 1911, 1912 and 1913. This was where she first met her future husband Diarmuid Coffey. There was phonetics, conversation with local native speakers, dictation, grammar and ceilidh dancing in the evenings. Cesca and Margot drove each other on as, between 1908 and 1913, they worked out their Irish Irelander identity. They read voraciously, exchanging notes on the standard and latest works of Irish history. They planned a book of conversations and anecdotes from their travels, revealing local traditions, folklore and customs. The 700 years of England’s captivity, these girls believed, represented a stage in the struggle of ‘contending civilizations, with theories of life and government utterly opposed to one another’. This was at first a romantic and deeply idealistic form of cultural nationalism. Then, during the months that she spent in Paris from October 1913 to May 1914, Cesca established herself as a formidable political activist. She drew cartoons about the Home Rule struggle and Celtic costume designs for the Gaelic League paper An Claidheamh Soluis. She also designed a propagandist poster for the Gaelic League. Having returned to Dublin from Paris in June 1914, Cesca was on the quay at Howth for the gun running, as the Asgard nosed in, with Erskine Childers at the helm, the following month, on July 26th. She was staying there with the Coffey family, leading nationalists and figures in the Irish Literary Revival. Diarmuid Coffey was on the gun-running exploit himself. At last they began to march towards us... They came nearer and we saw them. Then we cheered and cheered and cheered and waved anything we had and cheered again. To see and hear that was the best thing that ever happened to me in my life... Another armed detachment were standing just below us, they smiled up at us and we at them. ‘Do these people know you?’ Mrs Coffey said. They didn’t of course but how could I help smiling at them? Cesca was exultant in her journal that evening. The raid was so daring: in ‘broad daylight under the nose of the helpless coastguards and so well carried out that no one was prepared against them’. The armed Volunteers now, to her mind, held the future of Ireland in their hands. She found watching the men drilling, in a sunlit field a few weeks later, quite ‘heavenly’: ‘rather a change from midnight in the glen at the rising of the moon’, she remarked to Margot. The episode at Howth had knocked the Ulster gun running at Larne, ‘winked at by the English, into smithereens’, she concluded. On their way back they fired on the citizens on Bachelor’s Walk. Twenty people, mostly women and children, were hurt. It’s like an Englishman to fire on women. One has since died at Jervis Street hospital, where they were all taken. I hope the soldiers will be identified and hung. Diarmuid says any Dublin jury would convict them if it got half a chance. Some volunteers came out and made a cordon this way, hand to hand, and made the congregation go out quietly in line. Some boys started whistling. They said , ‘No whistling, please’, and they stopped. In the evening, which was getting dark, nothing was seen but a great host in the dying light, and nothing was heard but weeping... and Chopin’s funeral march, as the coffins went past. God did not make you Irish for fun. He made you Irish because he has work for our country in the world... you wouldn’t like it if our boys here ever had to fight and they were shot or cut in the leg or arm or head and you could do nothing. Between July 1914 and April 1916, busy with her work at the Dublin School of Art and in her studio at home, she regularly attended Cumann na mBan meetings, preparing herself for the possibility of confrontation between the nationalists and the British authorities. Innocent of the coup through which Patrick Pearse and Sean MacDermott deprived Eoin MacNeill of his leadership of the Irish Volunteers, Cesca was incredulous when she heard that the Sinn Feiners had risen and had ‘got all the principal bridges’ on April 24th, 1916. But she was in no doubt that she was called out. ‘I took all the ammunition for a rifle in my bag and also some bandages and compressed food,’ she wrote in her diary that evening. She left the family home, Temple Hill in the suburb of Terenure, with a male friend, without her mother knowing where she was going. ‘There’s war in the City’, an idle tram man told them at the terminus. She reflected that she must ‘get to some Cumann na mBan people to see what was doing’, as she hurried on, finding it ‘hard to believe that Eoin sanctioned this apparent madness’. ‘Dublin is ours and the Castle after 700 years’ a nice brown-faced man with his bandolier, belt and rifle told Cesca, when she checked that there were first-aiders in the makeshift garrison being created that afternoon at St Stephen’s Green. The Countess Markiewicz was there. Jennie Wyse Power, a senior Cumann na mBan colleague living in Henry Street, sought to dissuade Cesca from becoming involved. She was bemused by Jennie’s assurance that Eoin MacNeill was backing the Rising. She was determined at least to deliver her first aid things and she did this at the GPO, where the tricolour was now flying and Pearse had just read the Proclamation of the Republic. I decided to go to Eoin MacNeill’s headquarters and ask him whether I’d be more use inside than out. I went in first and left the first aid appliances ... They had volunteers with arms at every window of which the glass was all broken and thrown about in the street and a little inside ... They were protected behind boards and bags, letter bags a good many I expect ... I went off by Camden Street. There we passed Jacob’s Factory, in the hands of the Volunteers, who were sitting quietly at each window, while some women were yelling at them below. There were bullet holes in the windows and in some of the shops opposite, hence a lot of broken glass. I asked Mr Pearse had he any message he wanted sent to Eoin MacNeill. He said ‘Have you seen him? ... What does he think?’ I intimated what I believed he thought. ‘You don’t seriously think you’ll succeed, do you?’ said I. ‘We would have’, said he, ‘if it’d been on Sunday. Eoin MacNeill spoiled it’ ‘It seems to me mad,’ said I, as I took the little note he gave me for his mother or sister as I was going out that way, ‘and I thought your idea was to be on the defensive.’ ‘Our idea was to win Irish freedom’, said he with a glow in his voice. I am aware that I ought to have spoken with more vigour, but while I’d been walking up and down waiting for his note to be written I saw things I shall never forget, a row of young fellows kneeling saying their prayers and two priests came in while I was there, and began to hear confessions kneeling by the side of them; at a little distance a Proclamation to the people of Ireland – of the Irish Republic... I read it, it included the phrase ‘our countrymen in America’ as far as I remember, and ‘our gallant allies’, either ‘in Europe’ or ‘on the Continent’. Of course that will damn them. If they don’t win, and it is impossible that they should, they’ll all be shot. Cesca bicycled out to Woodtown Park that evening. Mrs MacNeill opened the door to me and brought me into the study... I joined their circle and acquired the following information. From Friday night to Monday evening Bulmer Hobson had been a prisoner in a private house on the north side, because he and Eoin MacNeill had tried to stop what he called an ‘act of criminal lunacy.’ They were furious. All Thursday night, when Bulmer Hobson discovered it first and came out to the National Volunteers, they were working at a plan for countermanding the Sunday parade which was to be real instead of only a parade. All Friday he was distributing them. On Friday night they decoyed him to a house on pretence of a committee meeting and kept him there. They used Eoin MacNeill’s authority to imply that he was behind it, in an unscrupulous fashion. ‘If by a miracle they succeeded, of course, I suppose they’d be justified; but if we’d shot a few of them, I’d have saved the country’, said Bulmer Hobson. They all took the most gloomy views. There was one relative nearby who Cesca felt she could trust. This was her cousin Wilbraham Trench, who was Professor of English Literature at Trinity College. ‘We laid bare our hearts in a curiously intimate and personal way and it was rather a consolation’, she recorded, after he paid a call at Temple Hill on Wednesday morning. The next day, having pondered the personal danger Cesca had put herself in by entering the GPO, he spoke to her firmly about her responsibility to look after her mother: ‘it was rather nice’ that he was ‘keen to know whether I had got rid of all ‘incriminating papers’. ‘My writing table hasn’t been so tidy for years’, she noted, confirming that she took him seriously. Cesca and Diarmuid cycled to Dun Laoghaire on Wednesday, finding it swarming with soldiers off the boats that were bringing forces to repress the Rising from England. Four battalions of the Sherwood Foresters had landed that morning. They went up to Killiney Hill, finding a stretch of grass to sit and eat the oranges and chocolate they had bought. ‘It seems almost incredible’, said Diarmuid, ‘that there should be revolution in Dublin and that you and I should be having a picnic on Killiney Hill’ ... the bay stretched round there blue and misty, and the water curled round on the sand. It seemed like summer... We discussed what he should say if I called him as a witness on arrest... He looked awfully white and tired, not having slept much... We related minutely what we either of us had seen or heard up to the time we met and I told him all the MacNeills told me and he told me about the life of Dr Hyde he was writing and what our mutual plans were or had been for the summer. Nationalists who had found the ground stolen from under their feet, Diarmuid and Cesca felt on the edge of nothingness that day. The next three days were ones of despondency for Cesca, two miles from the city centre, at Temple Hill. There was a swirl of rumours and tales of slaughter on both sides in the struggle for Dublin. On Thursday intermittent firing could be heard all day and Cesca heard volley after volley as she wrote up her diary. The hardest thing had become living in a divided household. ‘Mother has started referring to the English soldiers as “we”,’ she noted. She could only think of the bravery of the Volunteers, who she had watched train and for whom she had collected funds over two years. ‘Grey is the evening,’ she ended, ‘when Irishmen die’. This mad affair has done irreparable damage to the cause of Irish freedom which it is meant to serve, as it can only succeed by a miracle which isn’t likely to occur. God help us, I think it will break all our hearts. In case you are anxious about my share, I had none, it was done against the leaders of the Irish Volunteers and all sensible men among them, but there are many who will suffer innocently. Seamus Connolly is a man whose chief merit is his desire to see his country free but he has no other qualifications for an affair of this kind. Most of the others are high minded but utterly lacking in judgement, poets, or they wouldn’t have run us into such idiocy. This is all in confidence to you. Please don’t mention this opinion of mine to anyone who has no sympathy with the cause, as it is an opinion only. Once Pearse had surrendered, the Rising was quickly over. Only sixty-four of the actual insurgents were killed during the week but civilian casualties were 450 killed and 2,614 wounded. 116 soldiers and sixteen policemen died during the week. Cesca’s account adds to the evidence of ambivalence towards those who manned the garrisons. Sympathy does seem to have increased during the week for those who risked everything for Ireland’s freedom. Because it is so apparent that, in the long run, the success of the Rising lay in the effect of the British government’s fierce reaction to it, the strength of a spontaneous tide of nationalist feeling in Dublin may easily be underestimated. Reggie reached Dublin about May 3rd, the day that the executions got under way, with the shooting at dawn at Kilmainham Gaol of Patrick Pearse. The next weekend he was granted two days leave to go and see his mother and sister. His wife and daughter would soon be coming over and would live at Temple Hill. Meanwhile, how could he and Cesca, now on opposite sides in a bitter political struggle between Britain and Ireland, speak of politics? In her diary, Cesca caught herself with determination, putting aside wells of emotion and family tension: ‘Reggie came on Sunday when we were eating breakfast. He was amiable and good tempered and good-spirited and stayed the night and went off last evening.’ The family maintained its private peace. The heavy rain of the previous few days seemed to say it all. It was spoken of, a friend visiting said, as ‘Eire weeping for her sins’. ‘I worked a little but was so deeply depressed that it affected my thinking,’ Cesca noted. ‘We have no right to say we love Ireland unless we are prepared to work for Ireland,’ Margot declared in a speech in 1914. This is what Cesca, like her sister who was a social worker in Belfast, did wholeheartedly in the two years after the Rising. She was always busy: studying Celtic art in the National Museum which gave her many ideas for creative artefacts, organizing a pageant play about Brian Boru at the Carrigaholt Irish College and painting murals there, making portrait sketches at Sinn Fein and Gaelic League meetings of key nationalist figures of the day, creating Christmas cards for the Gaelic League, attending Cumann na mBan meetings. In March 1917 Cesca agreed to marry Diarmuid. ‘That day will always be “a spring day of the soul” she wrote to him a few days later, ‘you are my love beloved Diarmuid, I see you as I never did before.’ That summer she was back working at Carrigaholt at the mouth of the Shannon. She exulted in De Valera’s Sinn Fein victory on July 10th in the East Clare by-election. A new political world was emerging. I went to Rathfarnham this morning and saw Diarmuid Coffey married in Irish to Cesca Trench – a big handsome girl, her brother has just been killed, but they didn’t alter the day for the wedding, just went on with things as they had been arranged, only the invited guests, friends just went to the church – it was very grave and quiet. Reggie had been killed in the great German offensive on the Western Front on March 21st. Despite this grievous blow, letters from the next five months testify to the happiness Diarmuid and Cesca found together. When Cesca herself died of the Spanish Flu on October 30th, after a few days of high fever, letters of condolence poured in to her husband, her mother and her sister. Their constant refrain was the loss sustained by her death to Ireland. Aunt Francie wrote of Cesca’s ‘fine, generous and unselfish nature’ and of her ‘gifts of intellect and charm’. The Headmistress at her school recalled an ‘ardent and radiant spirit’, who was ‘the very incarnation of youth, strength and vitality’. ‘Her life was devoted to Gaelic Culture and the Irish people,’ recorded an obituary in the journal of the Gaelic League. At her graveside, the Dublin branch of the League said the rosary in Irish. Anthony Fletcher is Emeritus Professor of English Social History at the University of London.